Did you really think the New York Mets were going to turn it around following their 2-0 win this past Sunday night against the New York Yankees? The way I see it, the Mets were lucky to escape. In fact, it was ESPN’s Matt Vasgersian who said, “The Mets survive” following Todd Frazier’s double play that ended the game. That has to be the most Mets thing ever said following a win this year. The Mets proved that Sunday night was simply just that… luck. The team was embarrassed in Atlanta after being swept by the Braves loosing on Tuesday 8-2 and yesterday 2-0, both in horrific fashion. The Mets have lost 16 out of their last 19 games, they are batting .137 in the month of June (.226 overall), the bullpen has given up 21 runs in the last 11 games, and they look like they have simply given up as a team. Now, I’m not taking any credit away from the Braves, they are a great team and they have been a solid story all year. There is no doubt they will be in the mix come September, but the Mets had multiple opportunities to put this series away. As mentioned earlier, the Mets only scored two runs in the series, they left eight runners on base, and went 1-9 with runners in scoring position. We can go through all the details and how bad this series was, but this really boiled down to a few things that need to be addressed, and in some cases, things that need to be addressed again. What else do you want Jacob deGrom to do? Yesterday, deGrom had another solid outing pitching seven strong innings, striking out seven, and giving up one run. Unfortunately, in that effort, he suffered his second loss of the year. With his most recent start, deGrom’s season ERA is at 1.55 which is still the lowest in the National League. It really is amazing that deGrom is one of the top pitchers in the league, but nobody is paying attention to how good he really is, because the supporting cast around him has been awful. To deGrom’s credit, he is everything you ask for when it comes to being a team player and professional on and off the field. If you are a Mets’ fan, or a fan of baseball in general, you have to feel bad for deGrom. He is 4-2 this season when he should really have 10 wins. It has gotten to the point where if deGrom gave up a run or two, the Mets are likely to lose the game, because nobody can hit. As good as deGrom has handled himself, it will be interesting to see if his perspective changes as this dreadful run continues. deGrom may be the best in the rotation, but the starting pitching has been pretty decent as of late. Zack Wheeler had a solid outing against the Braves on Tuesday, Steven Matz has been able to stay under control, and Seth Lugo has performed well in spots he was asked to produce in. Of course, nobody is paying attention to that, because the Mets couldn’t hit water if they fell out of a boat. The past two days, the offense has easily shown some of its worst moments all season long. In the last two games, Michael Conforto went 1-6, Todd Frazier went 0-7, Brandon Nimmo and Jay Bruce went 1-7, Asdrúbal Cabrera went 0-5, and overall the team only mustered 5 hits against the Braves. The offense has become unwatchable, in more ways than one, and it is a problem that only seems to be getting worse. We are seeing the same issues over and over again. The starting pitchers might want to start thinking about taking regular batting practice, because it seems like the pitchers are on their own when it comes to offensive support. Now, obviously Mickey Callaway wasn’t dealt the best hand, as we have seen. The team isn’t good and going into the season we knew that the offense needed to be improved and injuries would play a factor as well. Besides the bullpen, the starting pitching has been okay, which coming over from Cleveland as their former pitching coach, you expected it to at least be decent in stretches. 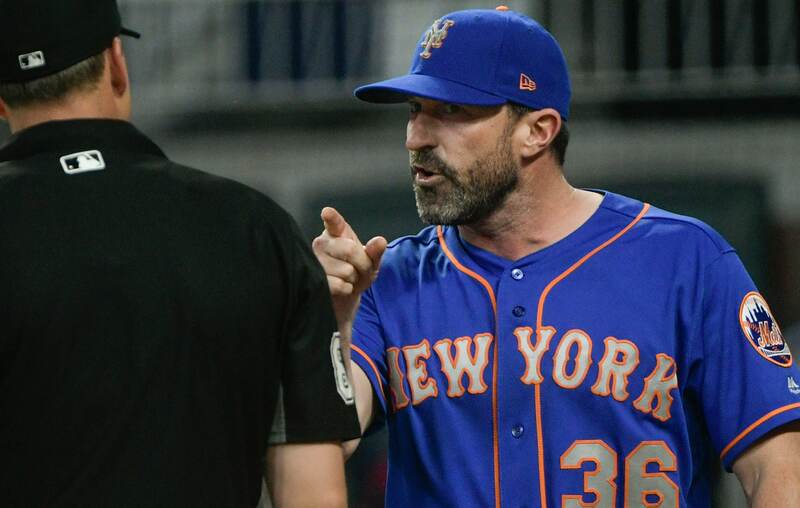 However, some of the decisions that Callaway has made during these games, like taking deGrom out yesterday after only throwing 86 pitches down a run, has made you scratch your head and it has gone so far that many are saying Callaway needs to be fired. While I believe he doesn’t deserve that, because of the team he was given, I won’t shy away from the fact that not only has he made poor in-game decisions, but there were moments that he has acted way too calm and tried to make the media believe that everything was okay. In case Callaway didn’t know this, if it wasn’t for the Mets’ 11-1 start, they would be the worst team in the league today. Besides his ejection from Tuesday night’s game in Atlanta, he has acted way too calm during pivotal moments where any other manager in the league would have been tossed in ten seconds. One week ago, he even went as far as to blame the city of New York for the pressure that the Mets are facing as well as their horrific performance as of late. Here’s Mets manager Mickey Callaway after his team got swept over the Chicago Cubs over the weekend answering a question during the postgame press conference & discussing the fact that players might be putting too much pressure on themselves playing in New York as oppose to a smaller market like Cleveland. The way I see it, Callaway is already beginning to push his luck when it comes to his Mets career. If he doesn’t start showing some fire and passion to try and get this team fired up, the fans that haven’t turned their back on Callaway, will do so very soon. WHAT’S NEXT FOR THE METS? Tonight at 9:40 PM, the Mets begin a huge four-game series in Arizona against the Diamondbacks. Jason Vargas will get the ball for the Mets tonight and he will be opposed by Matt Koch of the D-Backs. The last time the Mets faced off with the D-Backs, they swept them at home about one month ago. Both teams are incredibly different since that series took place. The Diamondbacks now find themselves back in first place in the NL West with a two game lead over the Colorado Rockies, they have won seven out of their last ten games, and they are playing much better baseball, especially at home where they will be tonight. The Mets go into this series eight games under .500, losers of nine out of their last ten, and they are only four games ahead of the last place Miami Marlins. It’s clear that this story is only getting worse, and while we have to credit General Manager Sandy Alderson for taking responsibility for the current product, he now has to do something about it. If this series gets ugly for the Mets, they could find themselves in the basement of the NL East by Monday and then we really will be discussing who to get rid of come July. Follow me on Twitter @SMMcChesney to send me your Mets comments as well as see all my Mets and NL East discussion during the 2018 season.